Welcome to the lesson three of the Oracle Workflow Training. One of the most common business requests for Oracle Workflows has been to track the progress of Workflow at its various stages. If your business user desires to track the progress of a Workflow, they can do so by viewing the workflow process diagram. However such approach has limitations related to security of the workflow attributes. Also, that approach is not user friendly, as the workflow may contain various technical but important steps that can confuse end user. Here is the deal, we will write a common workflow function, and re-use that workflow function at various stages of the workflow. 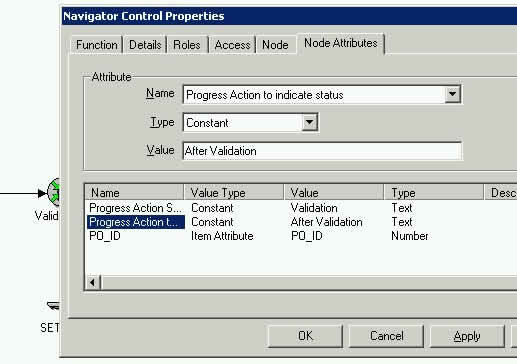 The workflow function will be attached to a pl/sql procedure that will insert record into a progress table. 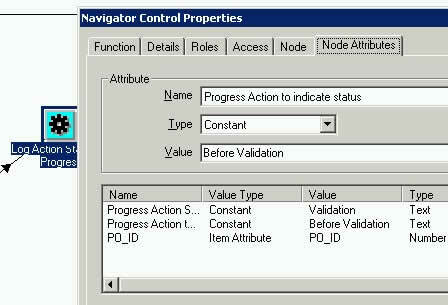 User can then trace the progress either via a screen on that table or by some report. The source code of Oracle Workflow Training Lesson 2 is being carried forward here. Please click here if you wish to step back for Training Lesson 2 for Oracle Workflow. 1. Create a table to track the progress. 2. Create a Workflow Function to pass parameters to indicate progress. Note: For each parameter for Workflow function, we will create one function attribute. 3. Write the pl/sql function to insert record into progress table. Step 3. 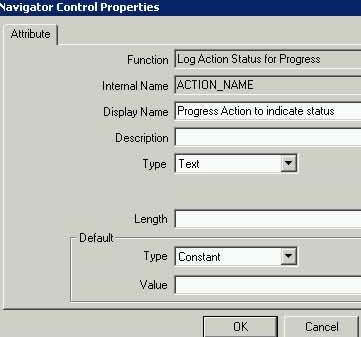 In the Oracle Workflow Designer Navigator, as in picture below, right click on Function “Log Action Status for Progress”and select new attribute(as created in Step 2 above). As a result of above three steps, you will see something similar to below. 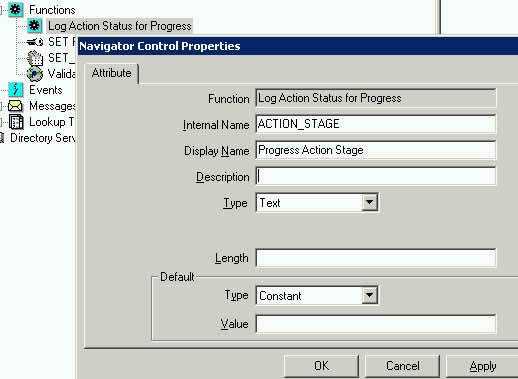 Select drop down list in section Attribute Name, select “Progress Action Stage”. Effectively, here we will pass the parameters to the WF Function. Step 9. Do nothing really, leave the PO_ID to its default value. Remember we had dragged this from WF level Attribute. 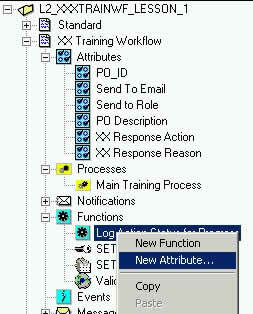 Hence the function attribute will inherit value for PO_IF from Workflow Level. Now repeat steps 7, 8 & 9. 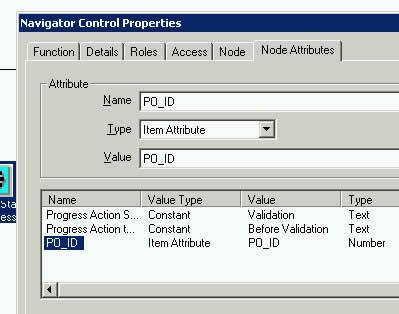 Note that the above pl/sql procedure simply reads the value from parameters passed under Node Attributes. Hence there is no hardcoding in the pl/sql. By doing the above, you will be able to track the progress of each transaction in a very simple way. Step 15. Initiate workflow as below…. You will then see two records created as below. The source code for Training Lesson 3 is available here . For any questions/comments on this training session, please leave a comment here. Nice job !! Congratulations & Thanks for such a nice trang. A small suggestion, why not you also start one Oracle workflow forum too. Just in case If we want to show some e-form (like PO application form) with process. The business rule is user should fill some mandatory fields in PO app form and than whole approval routing can be done and every performer can see/view that PO- app form ? Although Training lessons are quiet good to start up. But I feel that Training Lesson -1 was best, since it was audio-visual it gives you a feeling that one to one training is going on. I guess Trainee will always be with trainer in audio-visual trang, & secnondly, you were also giving some tips in audio-visual which i guess are quiet important. Could you pleae also load the audio-visual model for the workflow. It easier to go through once and then close the eyes and just listen while you speak. Fantabulous work !!! The training was very useful..Thanks for your time. I need to release my workflow customization work to the Production box after testing.before releasing to production box i am going to take a backup of the current version on the prod. But to release it to prod or other environments from Development which tool you normally prefer? Workflow builder or WFLOAD utility. WFLOAD can be used in DOWNLOAD and UPLOAD mode. 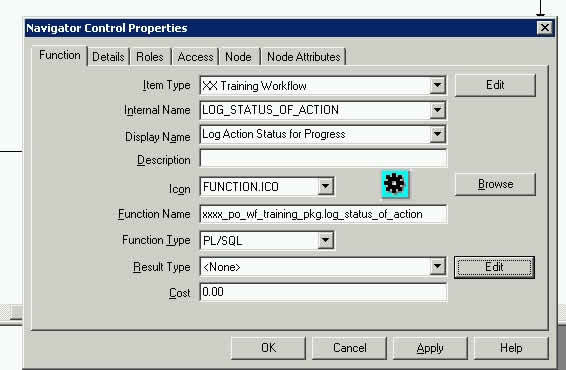 I have added a new workflow function which in turn will invoke a new pl/sql proc. This changed workflow file was saved to the database and the new pl/sql proc. has been successfully compiled. But when i execute the workflow,i'm getting a initialization error. The error says the function can't invoke the new pl/sql proc. I tried invoking an existing pl/sql proc. from the new workflow function, it worked. 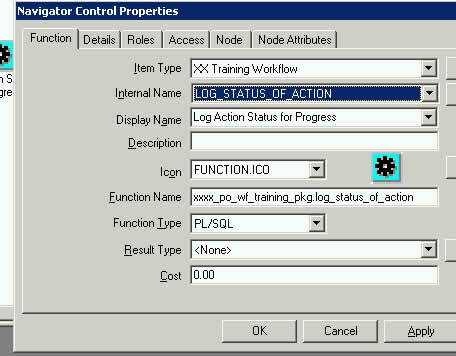 This clearly indicates that the new function is not able to invoke the new pl/sql proc. Can you please help me out? 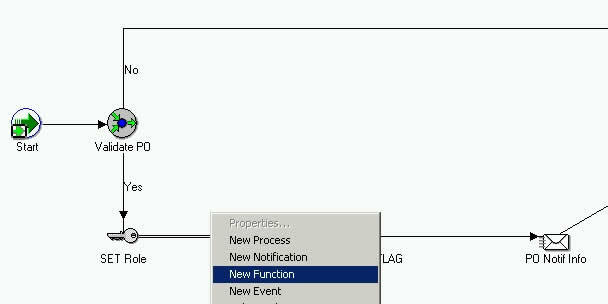 I want to launch a workflow process by clicking on the "Launch process"
link under Workflow Administrator Web Applications responsibility. 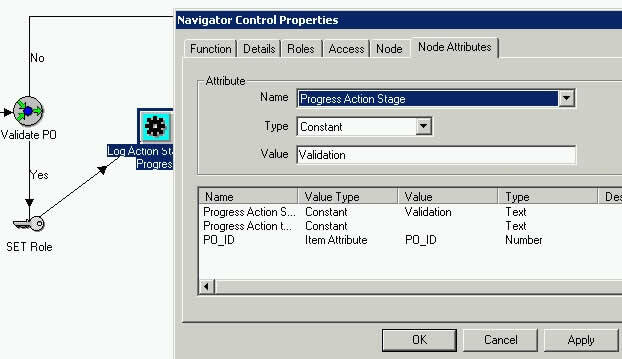 Web Applications responsibility in Oracle Apps 11.5.10.2. I have an assisgnment for whcih i require start to end flow chart for Order to Cash and Procure to Pay. I searched in Google & Metalink but,i didn't get the exact result. Is there any documentation on the types of errors faced at the end-users level for PO, INV, OM MODULES . This is some excellent work you are doing and I dont know if you have any idea as how much this kind of training lessons are helpful. Thanks and thanks a lot. here iam strucking. The workflow builder is halted. so give me some tips to customize the existing workflow file..
Hello Mr. Anil, your work in OAFramework and Workflow is really amazing. Can you also start technical trainig on Configurator if possible.